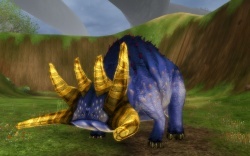 A bulky, thick-skinned plant feeder with tiny eyes and two massive horns protruding from the sides of the head. 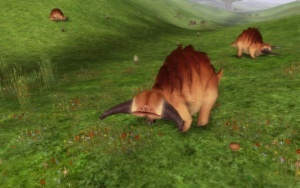 If singled out for attack, these horns can be lethal to even the toughest of predators. Grazes in herds to further ensure its protection. Occurs all over Atys. Naturally immune to Fear and Stun. Moderately resistant to Rot magic and physical blunt damage. Partially resistant to Cold magic. This page was last edited on 5 August 2018, at 10:40.